The staff conducted themselves professionally. We are satisfied staying there. this was the second time we stayed at the hotel and the rooms are always clean and tidy. There were lots of lot of hotels to choose from in Melbourne but we always choose this hotel because it has a very secure carpark and also has a tram stop outside the door. Everything is handy. staff was very helpful with providing directions for transport and local areas of interest for visitors. Very thoughtful in terms of noisy environment on the day we arrived there were road works going on outside and we were put in a room at the back to ensure we had a peaceful night. that was very nice. Booked due to proximity to course venue, also close to zoo and CBD by tram. Great value and generally helpful and friendly. Good restaurants a short walk or tram ride away on Racecourse road. Some slight "age" to some of the amenities and external areas such as stairwells but all was clean and the age did not impact on the function of the room. All in all I would readily stay here again if travelling solo. Not so likely for more than a couple due to the bedding only being double - no twin option. Convenient location to where my appointment was , only needed a place to stay overnight before appointment, ideal for this. A bit run down and walls are a bit thin (can hear other occupants). The gas stove top was interesting to operate. But had everything we needed for the night at a fairly cheap price, the location was excellent and the beds comfy. I would recommend to others (with warnings). Perfect location for attending events at State Netball and Hockey Centre. HAVE STAYED A NUMBER OF TIMES NOW. GREAT LOCATION AND EASY ACCESS WHEN DRIVING FROM NEW SOUTH WALES. GREAT VALUE FOR MONEY. WILL STAY AGAIN IN THE FUTURE. The rooms were very clean, and it has perfect location in central Melbourne - also it was easily accessible with trams only a short walk away. Staff were pleasant, and there was not too much road noise. Perfect location, close to Hospitals.... Clean, Friendly and certainly value for Money - a little noisy at night due to other guests. Comfortable stay at a great price. Nice clean room with everything need for a comfy night stay. It felt like having a home away from home. Once we found Park Squire it was a good central location. Nice friendly staff always willing to help. And very safe. Very pleasant and good location. Was very pleasant; room was cozy and tidy and staff was helpful. We found the stay very good value and will stay again in the near future, the apartment offered all the comfort and room we needed. More than pleased to recommend to any one thats looking for the not so new look but wants good accommodation. Very pleasant 1 bedroom apartment. Secure parking was good also. Were visiting family at Kensington and found it abit tricky getting in and out of but sorted that out after a day. 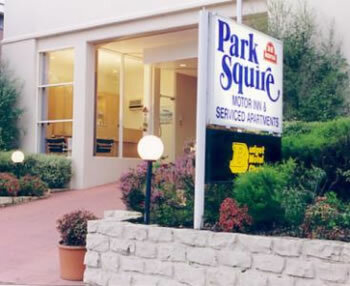 I have stayed at Park Squire on many occasions. Staff are always helpful. Convenient location, close to public transport & city centre. Rooms are always clean and tidy. Free undercover carparking. Very reasonably priced. We thoroughly enjoyed our stay in Melbourne the motels location to the hockey centre was perfect for our needs and it was easy to get into the city on the tram. very good. Good access to transport and very comforatable accomoadation. thank you it was just what was needed. I will be booking again the next time i am in Melb. Kindest regards Steven. Comfortable accommodation, no frills but good price. It was a nice place to stay, staff were friendly. Very pleasant thank you. The location to the city and the availability of travel were excellent. very comfey. would be good if the entry area was vacumed daily as it accumelated dirt because there is no front door mat. Excellent priced accommodation, large comfortable room, comfy bed, large TV, great location for quick easy tram ride to town and quick to airport via taxi or bus. We thought it was good value for a family stay , well situated and the breakfast was terrific for $5. Only wished they had nescafe beans not international dust coffee ! Very convenient location for visiting the Zoo. Easy to get downtown with tram. Early check-in highly appreciated. A bit cold first day before we got an extra heater. As always, a comfortable stay. Staff are very kind and helpful, and the room is clean.